I am a responsive WordPress theme inspired by Google Adsense placement recommendations. I keep your most valuable ads in prime position even as I adapt to different devices. See my demo site and live examples of sites built using me. I can be an Adsense theme or a multipurpose theme. Oh, and yes of course HeatMapTheme.com itself is built with me. My best friend is Click Missile. His ‘Super Ad Widget’ allows me to automatically replace desktop sized ads with mobile ads. He can do lots more too, such as adding extra in-content widget positions. Click Missile plugin is included when you purchase a Pro Membership. Want to display AMP Ads? Get this HeatMap Adaptive Pro AMP Addon and let it do the work. 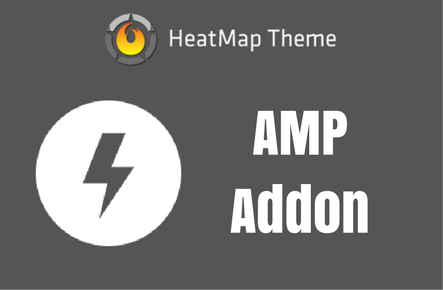 This addon gives you the potential to display AMP ads on your HeatMap powered site. Click here to get this addon for just $9. The HeatMap Pro Plugin adds extra features to HeatMap AdAptive. No need to change themes. Just add the Pro plugin and new features will appear in your HeatMap AdAptive options page. Click Missile plugin adds extra ad placement features to HeatMap AdAptive. If your site gets mobile traffic then this plugin is a must as it automatically detects mobiles and switches in your mobile ads, keeping your site and ads looking great even on small screens. HeatMap AdAptive Pro adds the extra widget positions in the hottest areas for mobiles. Click Missile plugin also adds the capability to inject ad widgets within the content of pages and posts, right where people are reading. With HeatMap Adaptive Pro you have the additional option to set the column layout for all pages, all posts and the home page. Individual page layouts can be set using the page templates included with HeatMap AdAptive. HeatMap AdAptive Pro allows you turn off the header, footers and navigation bars to create a completely minimal low distraction website or blog. If you are making a 'traditional' web site rather than a blog HeatMap AdAptive Pro allows you to easily turn off all the blog style elements sitewide to leave you with a clean and minimal looking low distraction website. If you make a site using HeatMap AdAptive you are free to sell your site without restrictions.